On Sunday, March 7th, 1965 hundreds of civil rights protesters were attacked and beaten by state and local police at the beginning of a march from Selma to Montgomery, Alabama. The Southern Christian Leadership Conference (SCLC) and Student Nonviolent Coordinating Committee (SNCC) had been organizing protests in the Selma, Alabama area in support of African American voting rights. In response to the death of protester and deacon Jimmy Lee Jackson, who was shot dead by an Alabama state trooper on February 17, 1965, a march was organized by the Southern Christian Leadership Conference (SCLC) and others from Selma to Montgomery, Alabama on Sunday, March 7th. 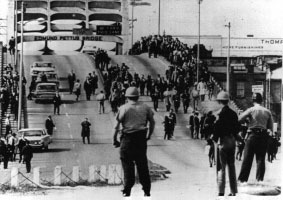 As the marchers crossed the Edmund Pettus Bridge they found their route blocked by Alabama State Troopers. When the marchers did not turn around, the world watched on television as the nonviolent protesters were beaten with billy clubs and immobilized with teargas. 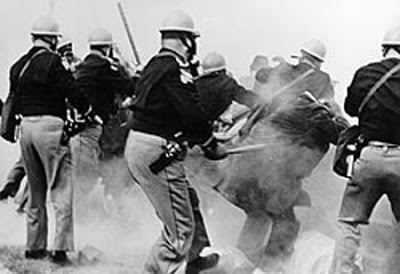 The video of the brutal beatings by the Alabama Troopers which left over 50 people hospitalized sent shock waves around the world as people witnessed the violent horror of racism in Alabama towards African Americans.This march led to two other marches with the final one on March 21 receiving federal troop protection for the marchers, The publicity from the marches aiding in the federal Voting Rights Act being passed on August 6, 1965. Civil Rights Movement Co-Founder Dr. Ralph David Abernathy and his wife Mrs. Juanita Abernathy follow with Dr. and Mrs. Martin Luther King as the Abernathy children march on the front line, leading the SELMA TO MONTGOMERY MARCH in 1965. The Children are Donzaleigh Abernathy in striped sweater, Ralph David Abernathy, 3rd and Juandalynn R. Abernathy in glasses. Name of the white Minister in the photo is unknown. I wish someone could put sound to this. 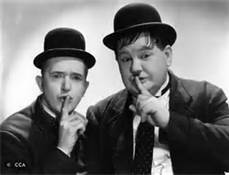 The TV footage is what turned me from the Young Repulicans. I was in High School at the time. The TV coverage was just horrifying. Children and adults being beaten without resisting. It was my awaking to the cruelty, inhumanity and prejudice of my race. I lost all respect for law enforcement in the south as well. Rep. John Lewis is a hero of the first order. 2. The TV footage is what turned me from the Young Repulicans. someone with an appreciation for my brothers and sisters of another color.